Analysing a Mach3 configuration problem. In October 2012 I helped a fellow DIY CNC'er to analyse a problem he was having with his 3-axis milling machine. In short he was machining a number of holes in a plate (ie milling them out with an endmill), all holes was identical but the machine constantly and repeatedly stalled the Z-axis when retracting from one particular hole. Same diameter hole, same feedrate, same tool, same everything*. The first three holes always worked fine, but when retracting from the fourth hole the Z-axis stalled each and every time - why? The actual problem in this case turned out to be a combination of CV (Constant Velocity) being turned on, backlash compensation being turned on but not setup properly AND the CAM-generated code for that particular hole being different than the other holes. Actually there's nothing really wrong with the code it just happened to "trig" this issue on that particular hole. In order to actually see what was happening I used my LOGIC logic analyzer from Saleae, great little tool by the way. Since the problem was with the Z-axis stalling I set the analyzer up to start grabbing data when the direction signal for the Z-axis changed from "down" to "up". First lets take a look at the output exactly as the machine was configured ie. with both CV and backlash compensation turned on. I should probably point out the following screenshots and descriptions applies when using Mach3 with the LPT-port. If you're using an external motion control device such as the Smoothstepper or KFlop etc they may (or may not) handle things differently, I don't know. Circled in green in the above screenshot is where the Z-axis direction signal is toggled and pulses start to go out to the Z-axis in order to pick it up from the bottom of the hole. This happens while both the X- and Y-axis are decelerating because that's exactly the purpose of the CV feature - it "blends" the moves together in order to get a more continous, flowing type motion. So far so good. Now, circled in red you can see the Y-axis direction toggled. Since backlash compensation is enabled on the Y-axis this is the time to take that backlash out. The way this is done in Mach3 is to stop all moving axes, apply the backlash compensation and then "restart" the other axes again. This might seem strange at first but if you really think what's happening it kind of has to be that way or the machine wouldn't be following the programmed path. (Which it may not do anyway due to the CV feature blendning the moves together but that's a completely different thing). The first step-pulse on the Y-axis is what initiates the direction change and the other three pulses is the actual backlash compensation - I believe. So the X- and Z-axis are decelerated, the backlash compensation for Y is applied and then the X- and Z-axis are accelerated again. This operation is hardly noticable on the X-axis because it's almost at a standstill anyway BUT the Z-axis is moving at a conciderable speed when told to declerate hard and then accelerate equally hard again. This is what actually caused the Z-axis stall. Here you can clearly see that the Y-axis direction being toggled (but this time from the other direction) before the Z-axis even starts to move. At this point the X-axis is decelerated hard, the Y-axis backlash is taken out, the X-axis start to accellerate again, then the Z-axis start to move out of the hole. In this case the Z-axis never needs to do that hard stop/go kind of thing it did on the other "non-working" hole so it doesn't stall. On the other hand, the X-axis gets a bit of a beating here but apparently it's so enough down its speed/torque curve that it can manage without stalling. Now lets go back to the offending, "non working" hole again and see what happens when you A) turn off the backlash compensation and B) turn off CV. A) CV turned on, backlash compensation turned off. Again, circled in green is the change in direction of the Z-axis and then a nice long acceleration. The Y-axis changes direction (due to that one single step for whatever reason) but since backlash compensation is turned off the other axes does not grind to a halt so everything works nicely -not a problem. B) CV turned off, backlash compensation turned on. 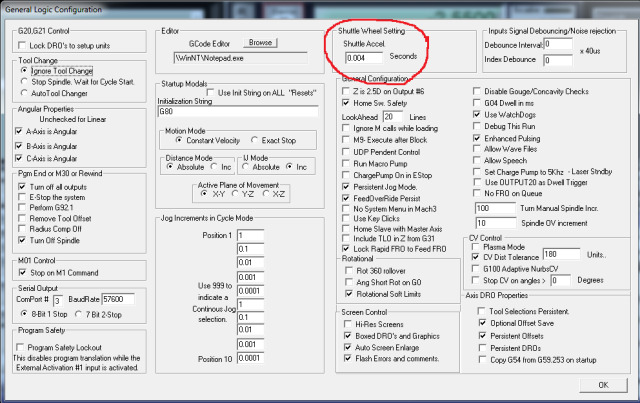 Here, because CV is turned off the Z-axis move isn't started until after both the X- and Y-axis has come to a complete stop (that's why the non CV mode is called exact stop) - each move is completed before the next is started. Again, you can see the Y-axis direction being changed, the X-axis "paused", the Y-axis backlash compensation applied and the X-axis "restarted". Then the Z-axis start to move - again no problem because the velocity on X at the time of applying the backlash compensation on the Y-axis is so low that it doesn't even notice. The Z-axis doesn't even move when Y-axis backlash compensation is applied so there's no problem either. So what's up with all of this, shouldn't you be able to use CV and backlash compensation at the same time? Well of course you should, and of course you can, but you need to understand how it works (which the above hopefully helps with) and you need to set it up in a way that the electrical and mechanical components of the machine can actually follow. As you can see in the above screenshot the Shuttle Accel setting is set to 4ms which means that decelration/acceleration time for any axis, when backlash compensation kicks in is just that - 4ms - and that's really not much time at all. 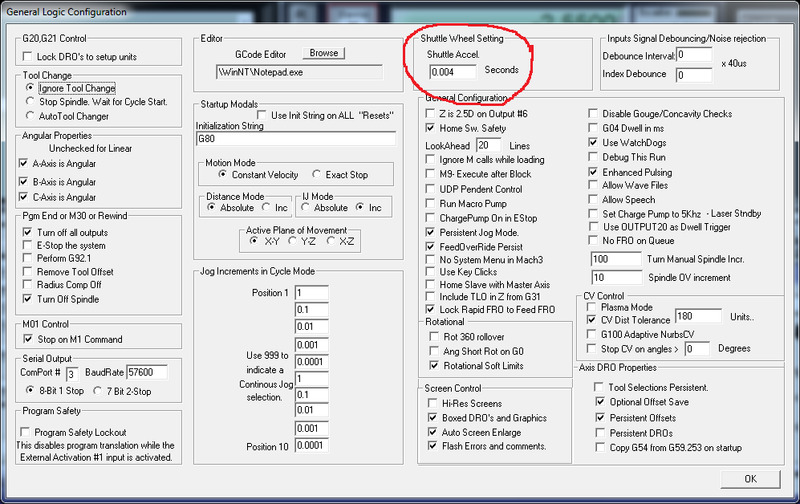 Besides, I think the setting is a bit strange because it sets the time it takes to decelerate the axis to a stop from whatever speed it's currently running at when backlash compensation kicks in - not from the maximum speed it CAN run at. The higher the setting the more noticable the the stop, pause, hesitation or whatever we want to call it will be when the compensation is applied but it's just one of those things where you have to compromise. The best way to deal with backlash will always be to remove it mechaically. In the actual case described here raising the Shuttle Accel time from 4 to 40ms fixed the issue. The next screenshot shows what the output looks like with the Shuttle Accel time increased. You can see where the direction of the Y-axis changes at marker 1 and where the backlash compensation pulses are applied at marker 2. There's pretty much exactly 40ms between the two marker so the setting works as described. After writing this I've received the question if I could explain why single axis moves works just fine at full speed yet two axis move doesn't - especially when the "angle" of the move is shallow, ie one axis moves a considerably longer distance than the other. If backlash compensation is enabled then my guess is that the most likely reason is the same as described above. The X-axis acceleration isn't very visible here due to the fact that we're "zoomed out" to see the full move but it's there. The X-axis accelerates and due the 1:10000 ratio there's basically 10000 pulses on the X-axis before the first pulse on the Y-axis. Everything is as expected and works perfectly. The issue is rather obvious - that gap in the X-axis output. The X-axis is well up to speed when the Y-axis figures it needs to take a step in order to "keep in sync". Because the direction is changed backlash compensation kicks in and decelerates the X-axis in order to compensate Y. If the shuttle accel setting is too low the X-axis can't cope with the rapid deceleration. The inconsistencies in the X-axis output I believe is tha backlash compensation for the X-axis. The bottom line is that of you have to use backlash compensation make sure you set Shuttle Accel setting high enough to cater for situations like this. Copyright 2013 Henrik Olsson. All Rights Reserved.